Hey it’s Deb again from Bowl Me Over – I wanted to come back and share another delicious meal in a bowl that will Bowl YOU Over! Anyway, thank you Jenny for allowing me to stop back again and share another great meal with you and your readers! Since spring is here and summer is fast approaching, I have some GREAT meals that celebrate the changing of the season! 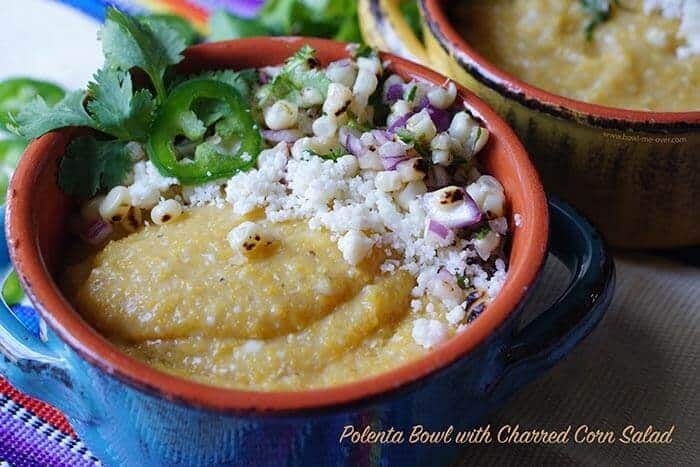 The first one I want to share with you is this amazing Polenta Bowl with a Charred Corn Salad. Does this look yummy and delicious or what? 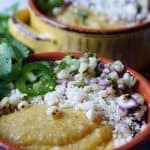 This polenta is super savory, the cojita cheese gives it a salty bite and the sweet springtime corn salad is bright, crunchy and amazing! Truly this is a delicious bowl of goodness! Never made polenta? Don’t sweat it! Polenta is so easy to make – you’ll measure out the polenta and pour it into bowling stock and whisk – this is so simple, your kids could totally do it (with supervision of course!). While the polenta is cooking make the salad. When we bbq corn, I always make a couple of extra ears. Put the corn directly on the grill – when you hear it “pop” it’s ready to be turned. You don’t want it blackened completely, just get some nice color on it! Remove the kernels from the cob and add them to a bowl, mince the onion and chop the cilantro. Zest & juice the lime and add that with a squeeze of honey to the salad and mix it together well. When the polenta is done, divide it between four bowls. Top each bowl with a spoonful of salad and some crumbled cojita cheese. If you haven’t used cojita cheese before, it is salty and savory (fabulous crumbled over enchiladas and nachos!) – I encourage you to give it a try! Your best substitute would be feta cheese if you can’t find it. 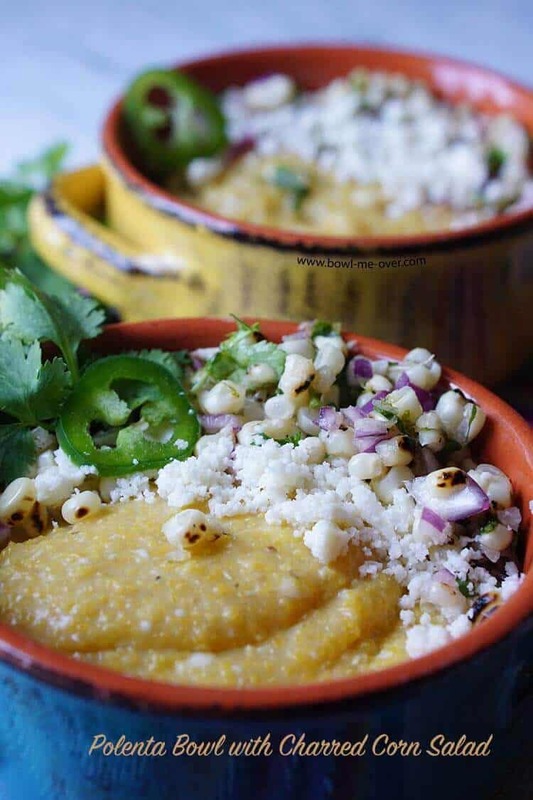 Add some flavor to your weeknight dinner with this delicious polenta bowl with charred corn salad featuring cojita cheese. In a large pan heat the chicken stock over high heat. 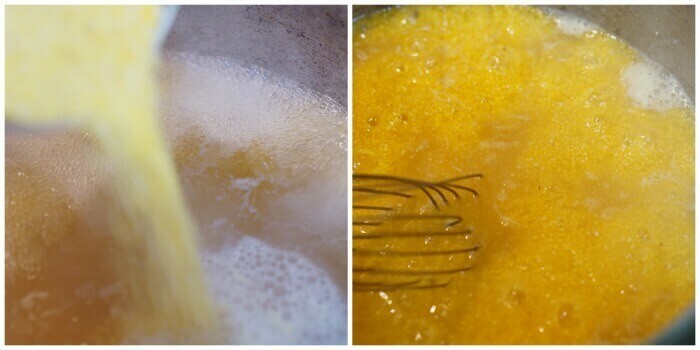 When it comes to a boil, add the polenta to the boiling stock stirring constantly to eliminate lumps. Return to a boil, reduce heat to medium low. Stir frequently and cook for approximately 20 minutes or until the polenta is tender. While the polenta is cooking make the salad. Remove the kernels from the cob, mince the onion, chop the cilantro. Add ingredients to a large bowl. Zest and juice the lime. Add the lime, honey and salt to the salad and mix well to combine. When the polenta is tender, remove from the heat. Stir in the butter and all but 2 tablespoon of the crumbled cojita cheese. Stir until combined. The cojita cheese will not completely melt. 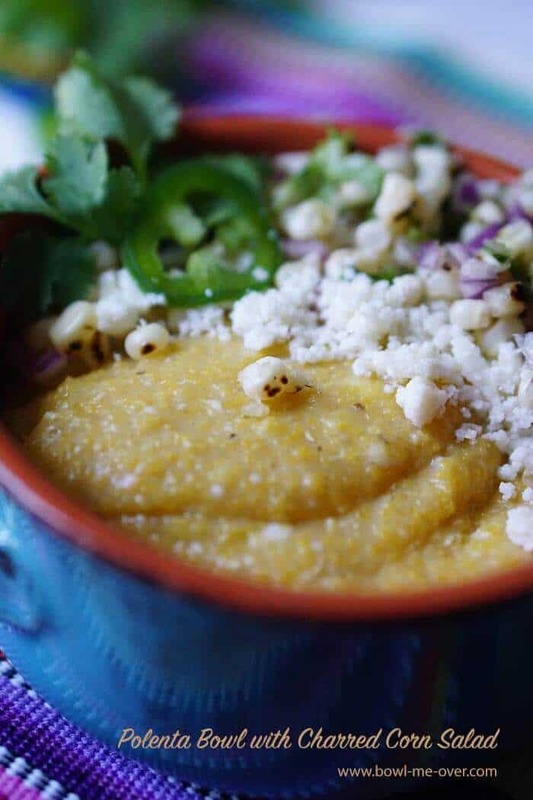 Divide the polenta between four bowls - add a couple of spoonfuls of the salad to each bowl along with the remaining cojita cheese. If you love this meal, then you will definitely want to check these out – 10 minute Chicken Caprese Pasta Bowl – YUM!! or this super delicious Vegetable Lentil Stew! 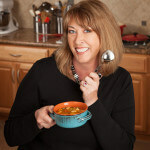 Debra Clark blogs over at Bowl Me Over where she shares her love all things in a bowl! Not everything is a soup or stew – sometimes it’s a delicious Buddha Bowl, a delicious and crunchy orange salad or even a yummy homemade ice-cream. I hope your readers really enjoy this recipe Jenny! Polenta is so easy to make and this is just delicious. Easy and looks fancy, but I’m telling you it is so simple and would be fabulous for a dinner party! !